A recent study revealed that three quarters of the rubbish found off Australia’s beaches is non-biodegradable plastic which is slowly strangling the life out of the wildlife. 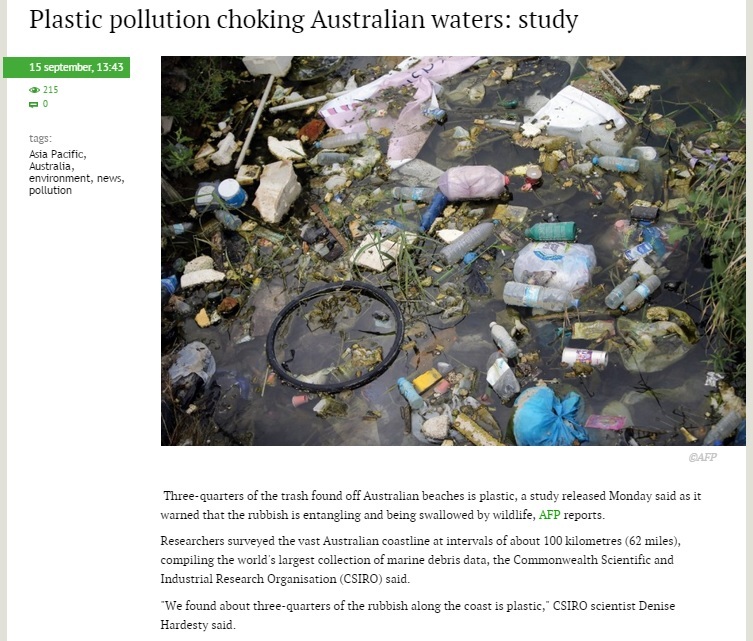 Moreover, the plastic trash originated from populated areas along the Australian coast, and could have been set aside together with excess scrap metal for pick up by recycling companies. The Tengri News website published a report which shows that if mankind doesn’t clean up its act, the entire planet becomes one giant dumpster. Rubbish found included glass and plastic bottles, cans, bags, balloons, pieces of rubber, metal and fibreglass as well as fishing gear and other items lost or discarded in or near the sea. This marine debris not only poses a navigation hazard but can smother coral reefs, transport invasive species, harm tourism and kill and injure wildlife, the report said. The study went on to describe how the ingestion of plastic and other non-biodegradable materials is slowly exterminating marine species such as leatherback turtles, whales, dolphins, fish, crabs, and crocodiles. Researchers predict that by the year 2050, if the proliferation of waste plastic isn’t curbed, roughly 95 percent of seabirds would have swallowed at least one plastic object. The report, funded by Earthwatch Australia with assistance from CSIRO and the Shell group of companies, came to one grim conclusion: the two main drivers of pollution are littering and illegal dumping. The public needs to be made aware that rubbish needn’t be tossed into the ocean when there are environment teams willing to take on the collection. Companies like Global Resources International Pty, Ltd. have made it their business to assist in the effort to make the planet cleaner and greener once more. Not only do they facilitate the collection of scrap metal and waste plastics, they also offer generous cash for scraps as added motivation for the public to lend a hand. As mentioned earlier, it only takes a phone call or email to have them haul away your trash (for which they’ll even provide bins). There is no more time to waste. Each day that passes without any show of compassion from us means more harm to our ecosystem. Get your family and friends together to save the planet now.